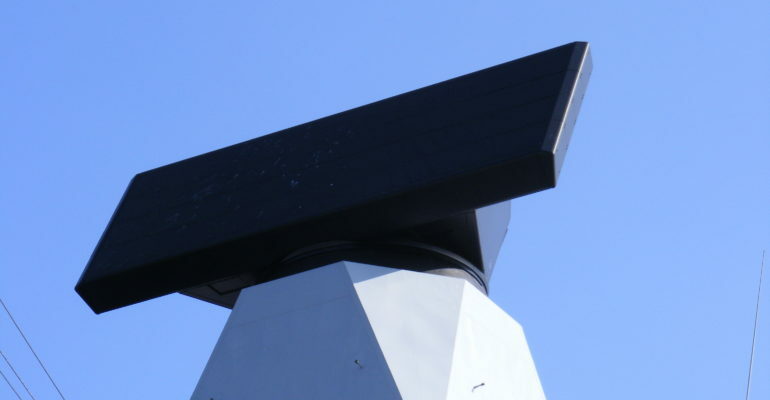 Designed for surface ships, the Signal Multi-Beam Acquisition Radar for Targeting, or SMART-L, is a 3D surveillance radar that provides long-range surveillance and tracking against conventional aircraft and medium-range surveillance and tracking against small “stealth” missiles. [iv]Built by Thales Nederland, the system has become a de facto volume search radar of choice for six NATO navies. [v]Using a phased array radar, SMART-L can provide accurate 3D target information and contribute to the threat evaluation process, allowing a ship’s weapon control system to commit to the fastest lock-on for engagement. [vi]The system can track up to 1,000 air targets at ranges up to 400 km, and its multi-beam operation allows the radar to acquire near hemispherical coverage in a single scan and perform accurate target elevation measurement in multipath conditions. SMART-L EWC Currently being tested is a significantly improved SMART-L design called SMART-L Early Warning Capability (EWC). The upgrade is a new active electronically scanned array (AESA) radar specifically designed to detect air, surface, and high-speed exo-atmospheric targets. [xi]The upgraded AESA antenna provides the EWC variant with greatly increased operational range, allowing the radar to detect and track objects up to 2,000 km away. [xii]Additionally, improved system components allow for increased elevation coverage, detection and tracking of high velocity ballistic missile targets, and enable estimation of trajectories, launch sites, and points of impact. [xiii]The new system represents a significant upgrade to the existing SMART-L and consists of hardware, software, and operating mode adjustments that improve system performance without major increases to the unit’s volume, weight, and power requirements. March 2016: SMART-L EWC produced its first air picture while mounted on a test stand at its Hengelo site. 2003: Thales built a prototype SMART-L radar designed for detecting and tracking ballistic missiles. Called SMART-L Extended Long Range (ELR), the prototype came to be called SMART-L Early Warning Capability (EWC) and has longer range than the default SMART-L.
2001-2001: SMART-L was deployed by the Royal Netherlands Navy.